Update as of 5:20 a.m. EDT: At least 146 civilians, including several children, have been killed in the Syrian border town of Kobani so far, even as clashes between Kurdish fighters and militants of the Islamic State group rage on, the Syrian Observatory for Human Rights said, in a statement released Friday. ISIS, which was forced out of Kobani in January after a protracted battle, reentered the town Thursday in a move that analysts claim is aimed at diverting Kurdish forces from their efforts to retake the ISIS headquarters at Raqqa. After nearly six months of peace in the northern Syrian city of Kobani, on Thursday Islamic State group militants clashed with Syrian Kurdish fighters who have been in control of the area since January. The new ISIS advance in the town bordering Turkey comes just as Kurdish fighters are nearing the ISIS headquarters in Raqqa, in a move that could be a diversionary tactic to take pressure away from the "capital" of the so-called caliphate. Clashes between the militant group also known as ISIS and the Kurdish People’s Protection Units (YPG) continued into the afternoon on Thursday, monitoring groups said. ISIS reportedly entered Kobani with a surprise attack from the city of Jarablus while simultaneously attacking a town south of the city, while Kurdish fighters had been focusing on countering the ISIS advance to the east of Kobani. “IS militants could infiltrate the city wearing YPG and pro-YPG rebel brigade uniforms,” according to the Syrian Observatory for Human Rights, a Britain-based monitoring group. ISIS did infiltrate Kobani early on Thursday, detonating a car bomb in a residential area. Later, reports circulated among Turkish media and human rights monitoring groups that ISIS had detonated a second car bomb, according to Washington Post. More than 40 people were injured and at least a dozen were killed in clashes. SOHR reported that eight ISIS militants and at least 12 civilians were killed. 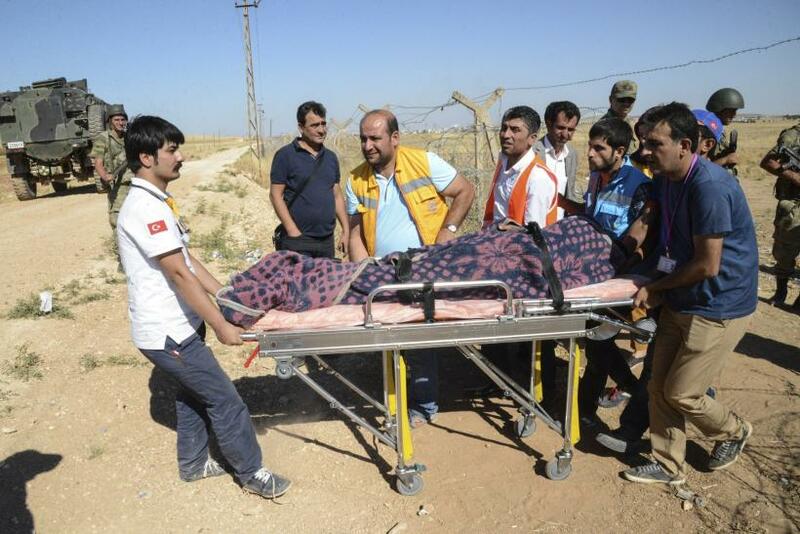 The wounded were admitted to a hospital in the Turkish town of Suruc just across the border. ISIS fighters also attacked Barkh Botan, a village south of Kobani, where they clashed with armed civilians who lived in the area. At least 20 civilians and five ISIS militants were killed in that fighting, according to SOHR. ISIS reportedly retreated “as a result of besieging them by YPG and the rebel factions from three directions,” SOHR said. Kurdish fighters have made significant gains in Syria’s northern provinces this year, hoping to consolidate territory previously under ISIS control. Earlier this week they were just 30 miles (50 km) away from Raqqa, where ISIS has reportedly been preparing for a decisive battle with Kurdish fighters. When clashes began in Kobani last October, the city became an important symbol for the fight against ISIS in Syria. Fighting between the YPG and ISIS lasted nearly four months and drew in allies from around the world, including an American-led coalition that contributed airstrikes. Iraqi Kurdish forces and some Free Syrian Army brigades were sent to Kobani to aid the YPG. Around 80 percent of the U.S-led coalition airstrikes between September and February were in or around Kobani. In January, Kobani was considered "liberated" from ISIS, but militants were still present in the surrounding cities.